Our most popular large combo if you can fit it! so much action jumping, sliding, climbing, basketball hoop, and a splash! Large 5-1 Combo jumper fun for many ages! jumping, climbing, and splash down the water slide! 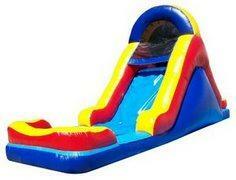 Great combo not too HUGE we can get it in your backyard for your little ones to play in. Age to about 7 but bigger will always have fun too! This is a great combo for many ages lots to play with and put your favorite character there too! End it with a splash! The marbeled vinyl on the side, rainbow, and unicorns down the slide will leave everyone smiling. 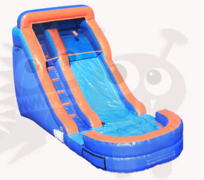 13x13 bouncing area, basketball hoop inside, 2 pop-ups, ladder to climb up and slide down into a splash pool. Fun filled, front loading single slide. 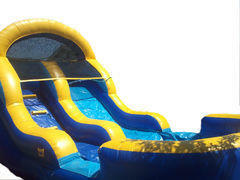 Slide right into the attached pool on a hot summer day! Great for the big kids of all ages too!!! 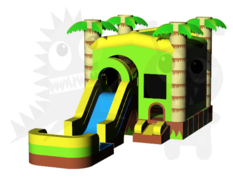 Infinity loop of sliding fun! Double sided slide ladder and slide on both sides. Slide into a small splash pool then climb up and do it again. For toddlers and elementary aged kids. 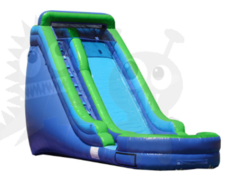 This is a great water slide aimed more for toddler age group to cool off on a hot day.